Excellent post by tedder42 about WikiProject Oregon being in the Signpost and I thought it was a great lead in to what is happening on the 2+ year old PortlandWiki. More rationale on why we are inviting folks to help us think through this! WikiProject Oregon was interviewed for the Wikipedia Signpost this week. Pete did a great job writing an introduction- enough so that Mabeenot elected to let it stand as the lede for the interview. To me, the most interesting sections were discussions about how the formal Collaboration Of The Week have ended and what that means, collaboration with other projects (where Pete explains why we have strong ties to the state), and Aboutmovies discussing why we need cash. in wikis and PortlandWiki, is scheduled to join us. Backspace Cafe (NW 5th, between NW Couch & Davis). Today I depart for Wikimania, the annual international user conference for the Wikimedia family of projects. I don’t know if there will be wifi on my flight, but it doesn’t matter, because I’ll be reading some Wikipedia articles anyway. Packed in my carry-on is a glossy red paperback courtesy PediaPress, a really fascinating new publisher that prints books using wiki content. 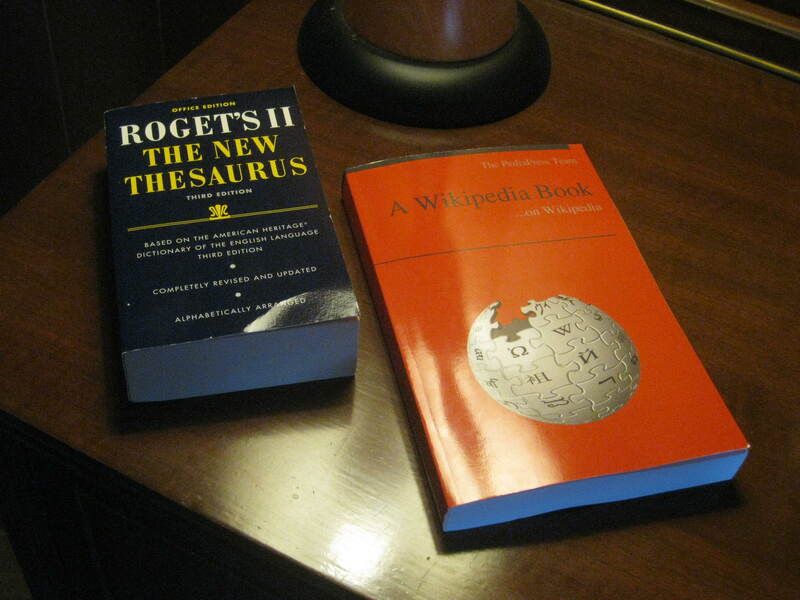 The team at PediaPress was kind enough to send me a book created from English Wikipedia articles. 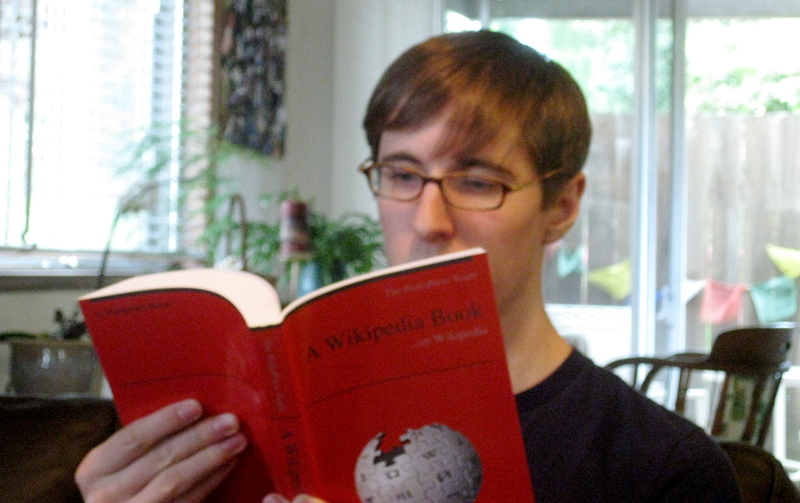 Being a wiki enthusiast and editor myself, this was a book about Wikipedia, made up of Wikipedia articles. Pretty meta, right? If reading about Wikipedia or other wikis isn’t your thing, PediaPress has an extensive catalog filled with arts, culture, history and every other kind of reference. For my bet though, the most interesting part of PediaPress is the ability to create your own custom book made up of whatever Wikipedia articles are important to you. Using the Book Creator tool, you can curate your own wiki book. This sort of personalized content is easy to get online but is less common in the print world. I think that what PediaPress is doing with . These inexpensive, easily modified books created from wiki content have potential applications more serious than amusing book nerds like me. I certainly know educators who would love to hand their students a textbook they’ve custom tailored to fit the desired curriculum. Like all Wikimedia content, these books also show great promise in areas where either there are no traditional textbook publishers or where they are too expensive. The PediaPress book is as nice as any paperback I ever bought locally or online, and is actually pretty meaty at more than 300 pages. The book arrived in good shape and is a pleasure to read, especially for those (like myself) that have held out against the e-book reader phenomenon. Sometimes, there’s nothing like a good book in your hand. Over at BlueOregon blog, Kari Chishom posits a theory about why the Oregonian, which just announced 37 new layoffs, is dying. (See below for a summary.) Of course, at WikiProject Oregon, we’re often focused on a different (but not wholly unrelated) issue: the Oregonian’s unwillingness to develop a web site worthy of the modern Internet reader’s attention. The Oregonian, like all newspapers, has endured declining revenues the past few years, the result of the recession and the migration of advertising to the Internet. That latter excuse, to be frank, is crap. The Oregonian newsroom folks who were laid off – and those that have survived – deserve to know that OregonLive.com is running an online advertising operation that is so bad that there can only be one explanation: They’re actually trying to earn less ad revenue. What do you think? Add your comments on the BlueOregon thread. One of the advantages of a wiki is being able to watch Recent Changes. It’s a nice way to see what is happening, either to watch for vandalism, to help collaborate on articles, or to see who is active. The problem is that Wikipedia’s recent changes list is that it’s crazy busy. There’s no way for one person to watch it. Wikipedia has a project devoted to tracking vandalism through Recent Changes, and there are even software tools written for this. Some members in WikiProject Oregon watch for changes on Oregon-related pages. I use a large watchlist, but a more authoritative way to do it is to watch all 9135 articles in the project through the RecentChangesLinked function. It’s even on this blog- look at the upper right part of the page. This list is maintained by keeping a list of every article in the project. WikiProject Oregon member EncMstr has maintained this list by hand (and using a hand-run vim script). I realized this would be a great use of the MediaWiki API. A long story later, but the code is done, released under the Berkley license and available on GitHub. It runs on my personal server daily; EncMstr used to run it every few months. Seeing the recent changes list more frequently allows us to watch the newest articles- another bot usually finds 1-5 new articles per day that are related to Oregon, and these new articles can result in a lot of collaboration between us. No, not the old New England shared space in the center of the village (AKA village green), but a sister project of Wikipedia, Wikimedia Commons. This is a place people upload photos with free licences to then be shared across the globe. The main point was to allow for a single repository for all images across all Wikipedias (English, French, German, etc.) that would allow for easy access between this different projects. That way the Germans could more easily find and use images of the US, and vice versa for US based editors and German images. Add the Germans certainly do use our images, such as one from an old house I took. Even the Japanese use it too, as the Hillsboro article has nine images of mine. But Commons has grown beyond this as site where many people and organizations go to find free content. Encyclopædia Britannica in their article on Hillsboro uses one of my images, as do some foreigners with WES, and Worldnews.com used a fish image of mine among many other images they have used from Commons. Searching Google has turned up many for me, and many for others on Wikipedia/Commons. Other images include Erratic Rock State Park, Council Crest Park, the Martha Springer Botanical Gardens where someone used this image for talking about gardening, and these folks at the Mall Hall of Fame blog used three of mine and countless others from Wikipedia/Commons. And these are just the ones that have actually given credit, whereas many others fail to credit Wikimedia or the individual photographers. In fact this image of mine I have seen in a variety of places on the web, often without credit, but here the Associated Contentfolks properly attributed the image to me (those folks are also heavy users of Commons images). However, I think I am most proud of getting on OregonLive in the proper manner. Last fall I warned them about using my image of Lattice Semiconductor without proper attribution, and they took it down (would have been easier for them to just add the caption in the story). So its nice to see they learned their lesson. Now, more importantly, what does this have to do with you? If you looked at some of the images, hopefully you liked some of them, but most are certainly not Pulitzer Prize winners. Some of my images could use some editing, and others filters, and other better lighting. But, hey, I don’t get paid for this. Anyway, Wikipedia gets free images which helps illustrate articles, and I get a sense of satisfaction/ego boost seeing my work around the world. And you can too! So, if you do not already have a Commons account, I encourage you to sign up for one and start uploading your images. If you need ideas for what to take a picture of, here is a list of images already needed. And who knows, maybe in a month or so your picture of a Bigfoot trap might make the front page in Mongolia.